DreamPlay will be havings its annual Spookfest, a Halloween adventure from October 28 to November 1, packed with thrilling games, exciting activities, special performances, and awesome prizes. 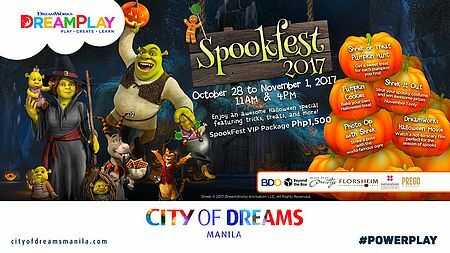 The Spookfest VIP Package for P1,500 includes an all-day pass at DreamPlay, an exclusive pass to the "Shrek or Treat Pumpkin Hunt," "Shrek It Out" Costume Contest, the DreamWorks Halloween movie at the Dream Theatre, a baking workshop at Gingy’s Kitchen, photo op with Shrek, and a Spookfest bag with DreamPlay goodies. DreamPlay is City of Dreams, Asean Avenue corner Roxas Boulevard, Entertainment City, Parañaque City. For more information, log on to City of Dreams' website.